When I wake up in the morning, one of the first places I check is Facebook. And today, one of my friends posted a video. She posted it because she works with teens and she wanted something to remind teens to take driving seriously and to be safe. I understand her reasons for posting it, but it was if she were speaking directly to me. I won’t post the video – it’s honestly too upsetting. In fact, after watching it, I cried, hard, for a full fifteen minutes. It was an ugly, silent, uncontrollable, gut-wrenching cry that ended with a pounding headache. The video was very graphic. It showed people being thrown from cars, smashed into poles and trees, crushed between obstacles, and thrown from motorcycles. I would like to think I’ve done a pretty good job at keeping my mental health under control throughout Kevin’s accident. I’ve been strong. Yes. I’ve had moments when I broke down and temporarily lost it (his surgeries were the worst moments for me), but overall, I’m proud of myself for keeping my cool. But when I watched that video this morning, that thread of control I’ve been so careful to keep from unraveling over these past several months, snapped. There was a time period, shortly after the accident, where I would close my eyes and picture Kevin hurling through the air. I felt his fear. And it made me sick to think of him lying on that road, broken, alone and wishing for his family to comfort him. I believe that’s one of the reasons I didn’t sleep much when we were in Columbia. Like a section from an old movie that had been spliced out, frames from his accident would play over and over and I just couldn’t bare reliving it through my mind’s eye. Now you know I’m strong, but I’m not invincible. I’ve had my moments when I’ve broken down and cried my heart out. I’ve had moments when I felt sorry for Kevin, for myself, for time lost. But we’re bouncing back. Our lives were only interrupted; we’re slowly getting back to normal. Through God’s grace, we’re pulling through this. And I’m confident that one day, we’re all going to look back on this time period and find it hard to believe that it even happened. Our lives will resume and we will have triumphed over Satan’s attack. I think that’s a large part of why Kevin and I are so determined to go on this vacation. Yes. It will be work. Yes. It will likely be difficult for Kevin. But we will NOT allow Satan to win. Period. And that’s evident in Kevin’s attitude, too. He has reached the point where he is sick to death of this entire situation. So, he’s refusing to allow it to slow him down. Case in point: That picture above. Tuesday, I was sitting at my computer when I heard the door open and close. I didn’t think too much about it, though I did think it was strange that one of the boys would have gone outside. (Our boys rarely get up from their computer chair, let alone voluntarily go outside). Five minutes later, I peeked outside to see who was out there and what he was doing. To my utter surprise, it was Kevin. And he was picking up tree limbs that had blown down from the last summer storm. I nervously watched him. He nearly lost his balance a few times, but overall, he did great. I wanted to help him, but I sensed that my help would not be welcomed. I watched him for several minutes before stepping outside. He was all smiles. It’s such a relief to him that his life is getting back to normal. He’ll be out there again, shovel in hand, sitting on his walker seat, just waiting to kill moles next. We also got Kevin into his truck on Tuesday, too. I fired it up (it hadn’t been driven in two months) and we drove around for a bit. Again, he was all smiles. He loved being able to ride in his truck again. In fact … the PT he saw yesterday said that he should be able to drive again, if he felt up to it. He suggested we go to a parking lot and see how it goes. So, we’ll probably go to a parking lot this weekend and see how it goes. Kevin said that he’s pretty confident he can drive, but he is wondering how his reaction time will be. Though we’ll test drive this weekend, I have a feeling he won’t feel ready to drive yet for several more weeks. Then again, this man is constantly surprising me, so who knows. The PT also gave him some sort of contraption that he attaches to his shoe. It’s supposed to help keep his right foot in the correct position. 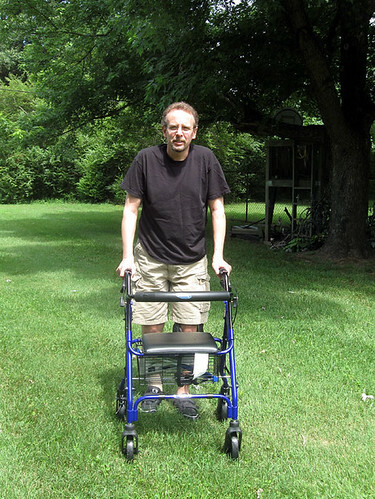 He has been having problems with being able to lift his right foot – they call it a foot drop – so they gave him this contraption to help him loosen the muscles in his ankle so he will have more flexibility. So life is moving along for us. Kevin truly is getting better and better. He does have days when he’s more tired than others, but don’t we all? He’s only taking three pain pills a day now, which is pretty remarkable considering it’s only been eleven weeks since the accident. But I’m blessed. I’m married to a very strong and very determined man and I thank God for him every day.